A while back in this thread, I mentioned that I planted cacti seeds over top of coffee seeds that were taking forever to sprout, and that the cacti seeds successfully sprouted. Well, the little cacti seedlings have all turned red, flopped over and DIED! ... the GOOD news is ONE of the coffee beans that somehow ended up on the surface germinated (I could see a little root tip growing out) a few days ago, managed to wiggle its root into the sandy soil, and is now starting to lift up the bean off the surface as of this morning (this is the stage I call sprouting). I'm visiting it often to cheer it on. 1/22 - 4 out of 10 seeds sank (presumable viable). Sowed them all in a pt. berry container in 2:1 sand:compost and set on Seedling Heat Mat. 2/15 - got bored and sowed mixed cacti and saguaro seeds on top. But "fruit"? Maybe "vegetable" It's a coffee bean, after all. Sorta like cocoa being a complete, balanced meal: cacao bean (vegetable), milk (dairy and protein). Sugar...well you know... ah... ENERGY! The coffee bean on the surface, with light germinated after almost 2 months. I haven't planted mine yet, cactus and coffee beans are still in bags. So, I think I will try surface sowing and light germinating for the coffee. What is up with the cactus, what would you say they died of, humidity? I would prefer chocolate to coffee. I could get some raw chocolate beans, but would they grow in my climate? You've got me thinking real directly here. Coffee and tobacco are the two most highly priced commodities around. Do coffee plants have an interesting aroma? How large do they become? Is it a viable Container/House plant? I've heard that even though they are shrubs, they can be kept smaller in containers with judicious pruning and root pruning -- though obviously as large a container as you can manage would be better... And you've heard of "Shade-grown coffee?" They can take less light, also prefer moderate temperatures -- not too hot and not too cold, in the similar range as modern homes -- and is supposed to make good houseplants. Only difficulty for most of us is that they say better flavor coffee beans develop in higher altitudes... hence "Mountain-grown". At least that's what I've read so far. We'll see how this little guy turns out. Isn't "bean" a misnomer? Aren't what we know as "coffee beans" actually the seeds from inside the fruits, sort of like cherry pits? Alright you got me -- I should have put " " around it: i.e. coffee "beans"
Doesn't it bug you when you find an interesting thread, but no one posted a satisfactory outcome or conclusion, leaving you to wonder how the plant did or how the project turned out? ...me too. It lives in an 8" clay pot and is about 18" tall with several tiers of side branches. No flowers or berries yet -- I'll post an update (if I remember) when that happens. Wow!! It is so beautiful! You could grow it as an ornamental. So how long before it might be expected to produce seeds/ "beans" and will one plant produce "beans" all by itself? Great job and thanks for the update! Flowers between 2-4 years, cherries (which is the correct term for coffee fruit - so yes, they're fruit trees) between 4-6 years, and full production after 5-7 years. Depending on the cultivar, it might want cross-pollination or it might be self-fertile. I have no way of telling you what it is, though, because you chose the coffee bean. That's for coffee grown at altitude in the tropics; I have no clue how it behaves as a houseplant. The coffee trees here spread seed like crazy. I haven't tried to sprout any, I just pick up seedlings from under the tree. I have had my coffee in a pot for many years. It is pretty tough, sometimes I forget to water it and it dropped most of the leaves, but came right back again. 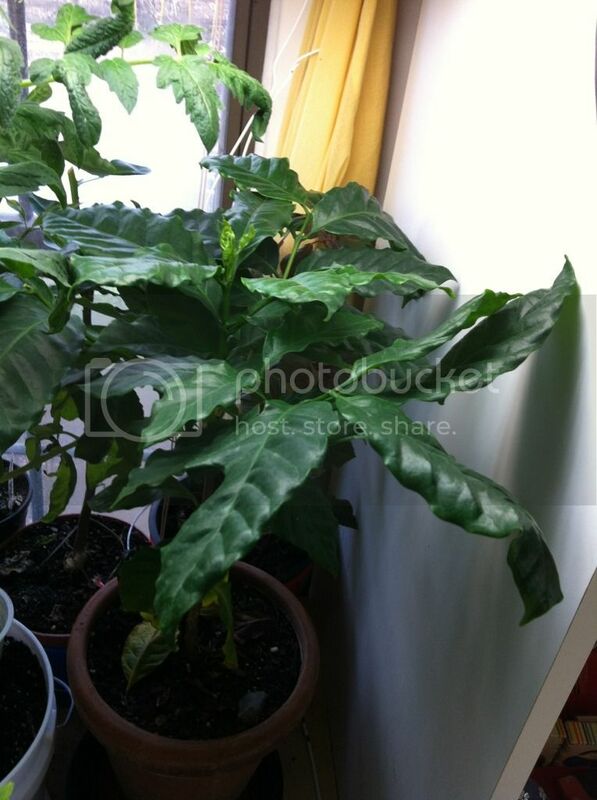 Nice coffee plant! We have one growing in my home that was started from a bean. It is a couple years old and is a bit smaller than yours. It has a few beans growing on it, pretty cool. You are giving e hope! Mine is branching now as you can see, which is supposed to be an indication that it is getting mature enough to bloom.